Fiat CEO Marchionne says Chrysler restructuring is more difficult than expected. FRANKFURT -- Fiat S.p.A. will achieve its target of selling 5.5 million to 6 million vehicles with Chrysler Group, its CEO, Sergio Marchionne, said on Wednesday at the Frankfurt auto show. Marchionne considers 6 million cars a year critical for an automaker's survival. Fiat and Chrysler currently have total sales of up to 4.2 million units -- short of the minimum of 5.5 million units the CEO has always targeted for survival. Marchionne also said the restructuring of Chrysler is a slow process, more difficult than he initially thought, but he sees significant improvement in 2010. Chrysler will present a five-year business plan by the end of November that will outline numbers and the path out of two years of difficulties. "We have to be absolutely clear about what we want to do with Chrysler and as a management team, where the organization is going to be in five years," Marchionne said. "We will share significant milestones, numbers and we will show how we're going to come out of this. This is a big issue and we're working really hard," he said. Chrysler emerged from bankruptcy on June 10 by selling most of its assets to a group led by Fiat. The Italian automaker took a 20 percent stake in the struggling U.S. auto maker in return for its technology to build smaller, greener cars - a deal under which no cash changed hands. Marchionne said Fiat still has no plans to invest in Chrysler and hoped the company would not need to seek outside capital for Chrysler's restructuring. "We were surprised by how little had been done in the past 24 months," Marchionne said. "It will be a slow progress in the beginning but we will see significant improvement in 2010." Marchionne said U.S. industrywide auto sales should top 11 million units in 2010, up from about 10 million units forecast for this year. But he warned of a risk of additional capacity being cut in North America if demand remained stagnant. 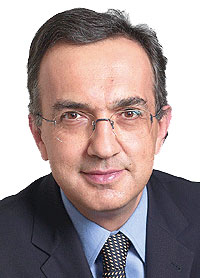 Marchionne said Fiat is no longer interested in acquiring General Motor Co.'s Opel/Vauxhall division. "I've completely closed with Opel," he said. Fiat was one of the early bidders for Opel. Last week GM agreed to sell a majority stake in the German carmaker to Canadian supplier Magna International Inc. and its Russian partner Sberbank.